The Indie Mixer is hosting a Game Environment Art Challenge wich you can check out right here. The Mix’s Game Art Challenge theme is Original Spin, it is meant to challenge artists to take something from their past and put their own spin on it, make it interesting. We want them to exaggerate the past and draw us into a new world that we’ve never seen before. To enter, artists need to create a concept scene based off of their favorite memory or place, something that has a special meaning to them. Everything created must be original and created during the challenge. Are you a video game artist? Enter our Art Challenge to win a personal portfolio review from a industry professional! There are two categories - Concept (which ends on the 14th), and 3D (which ends June 2nd). Again, check out the official site for all the rules and such. A weekend long LAN party at UoIT. 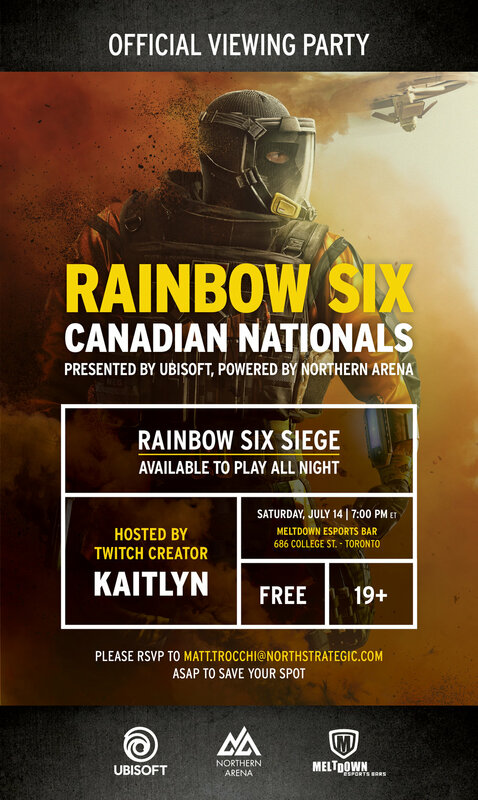 Join them for Ontario’s largest LAN party! More info on the Lanwar X website. Are you interested in getting started making games in Unity? Then DMG (Dames Making Games) has the workshop for you! This hands-on workshop will ease you in to using the Unity Engine and is perfect for beginners with no development experience. Tickets are free for DMG members and $35 for non-members. More details on the DMG website. Come down to Power Up Game Bar for a night of micro-talks and drinks with local developers! There’s plenty to learn at this fun filled event. EGLX is back! And arriving sooner than you think. EGLX is a celebration of all things gaming. What started out as a small get-together has grown into Canada’s largest video game event. Look forward to exciting displays from your favourite AAA and indie developers, an expanded kids zone with plenty of games for the younger set and 4 massive stages covering all the esports action in Canada Cup, the WESG Canadian national qualifiers and more. Whatever your game is, come play at EGLX in downtown Toronto, October 26 – 28! We'll have more as we get closer to the event, but if you're a developer you can register here, or interested in the tournaments you can register here. Tickets can be purchased here. Ludum Dare 42 is coming up! Ludum Dare is one of the biggest and longest running online jams in the world. It brings out a ton of amazing talent to spend a weekend making games and having a good time! Compo which is solo, 48 hours and everything for your game (except fonts) must be made during the jam time by you. It's considered hard mode, although it is the original rules for LD. Jam which is with teams, 72 hours and anything goes concerning what assets you can use. The only restriction is that you can't have started making the game before the jam time. Ludum Dare is a lot of fun and definitely worth checking out if you're looking for a large, competitive jam. More info can be found on the Ludum Dare website. Dames Making Games presents their monthly speaker social! Come down for talks and mingling with local developers. On July 27-29 Red Bull along with Bell Canada will be presenting one of Canada’s largest game development hackathon at AdrenaLAN in Toronto. There will be thousands of dollars of prizes to be won for the best hacks in areas like mobile games and VR/AR, along with workshops to introduce attendees to the world of game development and design. Beginners and first time hackers are welcome too! Any questions can be emailed to contact@omcn.tech. Bonus Stage will be happening at Power Up Game Bar on July 17th at 8pm! They're looking for speakers to those who are interested! Bonus Stage is a night of small talks, drinks and socializing. Come down, make new friends and learn something fun! A workshop to learn about how mobile applications and websites are spying on people. Meet up for a night of drinks and games at Get Well. A link with more info will be added once it is available. A night of drinks and games at Power Up Game Bar to celebrate Pride Month hosted by Toronto Gaymers. A Dames Making Games meetup to chat and learn about VR. This month's topic is Summer! Come for a night of micro talks and drinks at Power Up Game Bar. Meet up with other Unreal Engine developers for some talks, mingling and playing games. A free research talk presented by Dr. Mark R. Johnson from the University of Alberta and Dr. Tom Brock from Manchester Metropolitan University. The talk covers the design and integration of loot boxes in games and the impact they have. A night of short talks and mingling hosted by Dames Making Games. Check out ANYTHING commercial by Dogson featuring guest collaborator Emmanuel Laflamme at Electric Perfume from 6pm-2am. ANYTHING is part of a collaborative virtual reality improvisation series by Dogson, and has performed at various festivals such as AMAZE Berlin, the Creative Coast Festival, and Nordic Game Conference. This month's Toronto Game UX event is Testing with Toddlers with Spencer Winson. It's at 7PM at the Toronto Media Arts Centre, 32 Lisgar st.
Network event with craft beer, pizza, arcade videogames and great game audio-related conversations. Open to everyone and anyone interested in sound and music for videogames.